Lots of folks participate in SkyWatch! Whoa! I don't speak that language. You are so silly with your Wingding font. Beautiful picture. That's a very nice photo, reflection. What's up with the other stuff? It definitely detracts from your great shot! 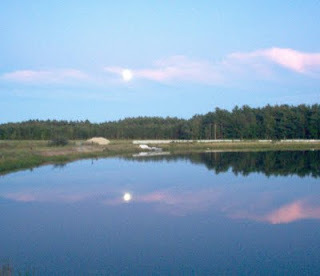 lovely photo--I love how the sky is perfectly reflected in the water! Take pictures of harvesting the cranberry bogs instead of ponds in front of them. Now thats cool.